I have been qualified with the Institute of Applied Equine Podiatry since December 2006. Since then I have trimmed and managed the hoof welfare of horses in England, France and Sweden. I work predominantly in the UK Midlands, (Leicestershire, Nottingham, Derby, West Midlands, Staffordshire, Warwickshire, South Yorks) but can visit further afield if required. 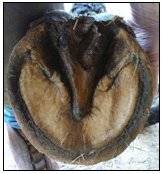 Please call or email to discuss your horse’s feet and to make an appointment.